President Yoweri Museveni has met with the new East African Community (EAC) Secretary General, Dr. Liberat Mfumukeko, who called on him today at State House, Entebbe. 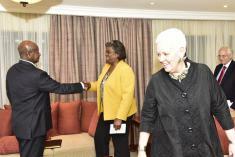 President Yoweri Museveni has held a meeting with the United States Agency for International development [USAID] administrator Gayle Smith and Assistant Secretary of State for African affairs Linda Thomas Green Field at the sidelines of the 27th AU summit, in Kigali, Rwanda. 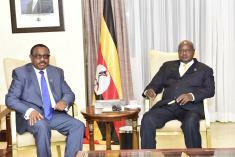 President Yoweri Museveni has met and held a bilateral discussion with the Ethiopian Prime Minister, Hailemariam Desalegn, at his residence at the Kigali Serena Hotel. President Yoweri Museveni has received the South Korean Ambassador to Uganda, Mr. Park-Jong Dae who called on him yesterday at State House, Entebbe. 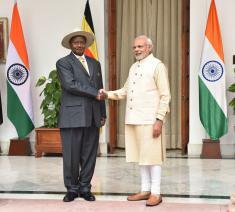 President Yoweri Museveni, now in New Delhi for the 3rd India-Africa forum summit, has held a bilateral meeting with India’s Prime Minister Narendra Modi at the latters office Hyderabad House. President Yoweri Museveni has called on the Organization of Islamic Cooperation (OIC) to increase investments in member state countries especially in the areas of infrastructure development saying this would boost economic development especially in the East African region.